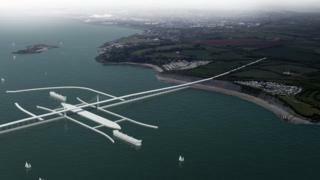 The chief executive of a firm wanting a £25bn barrage in the Severn Estuary has quit to set up a rival company looking to take the project forward. Mike Davies was appointed by Hafren Power in November but has quit, citing problems with the company. He is now setting up Severn Tidal Energy to pursue the barrage plans. The aim is to build an 11-mile barrage between Lavernock Point near Penarth, Vale of Glamorgan, and Brean near Weston-super-Mare, Somerset. But last year MPs said it would not be good for the economy or environment. In a report, the House of Commons Energy and Climate Change Committee criticised a "lack of information and a perceived lack of transparency" about the proposal by Hafren. The case for the barrage is "unproven" and Hafren Power "has yet to provide robust and independently verified evidence of the economic, environmental and technological viability of the project", the report said. But supporters of the scheme argue the tidal barrage could generate 5% of the UK's electricity. Earlier last year, former Welsh Secretary Mr Hain said the time had come to press ahead and build the Severn Barrage as the proposal has been "studied to death". Following the committee's report last June, Labour MP Mr Hain said the plans were "dead in the water" in the current Parliament as the UK government was guilty of "stubborn refusal" to engage. When the scheme was launched, he said the barrage would bring "considerable benefits" to the UK - creating about 20,000 jobs and generating 30,000 more in the supply chain and other parts of industry, giving an economic boost to south Wales and south-west England. The electricity generated would be equivalent to three or four nuclear power stations and thousands of wind turbines, he said. Hafren Power's main shareholder Richard Bazley resigned from the board last year after BBC Wales revealed he had been made bankrupt three times. Then four senior figures stood down at the end of last year including the chairman and chief executive. Mr Davies was brought in as the acting chief executive but has since resigned. He believes the proposals are technically, environmentally and economically achievable but plans to take it forward with his new company. A letter from the parent company of Hafren Power has been sent to shareholders saying that Mr Davies' resignation was orchestrated. It says that the company will receive shares in Severn Tidal Energy. However Severn Tidal Energy denies the owners and management of Hafren Power have any links with the new business. Roger Falconer, a professor of water engineering at Cardiff University, is a former advisor to Hafren Power but remains a staunch supporter of the barrage project, and says it was "was never dead in the water". "I've been happy to work with anyone who I believe can get this project delivered because I believe with the Severn Barrage, and with closely attached lagoons off the north Wales coast, we will be able to produce base power 24 hours a day," Prof Falconer told BBC Radio Wales. "I believe this project will have enormous benefits for the people of Wales, particularly in north Wales as well when you link it in with other projects which also offer massive flood defence opportunities."